“Story” is the use of word, image and/or sound, in any medium (print, web, film, video, novel, art, etc. ), to narrate an experience, typically with an emphasis on emotion, character and insight. As cave art tells us, storytelling has been essential to human communication since before recorded history. Public storytelling is story made widely available, with the potential to influence individual opinion and community and national policy. Story stands in contrast to exposition, the straightforward conveying of information, such as the standard “hard news” piece that is a journalistic mainstay. “Public square” is any place that a story can be shared: a newspaper, magazine, book, website, blog, song, broadcast station or channel, street corner, theater, conference, government body and more. The American origins lie in the colonial village square and the first presses, which published the pamphlets and newspapers that advocated the birth of a new nation. Henry is a news anchor and national security correspondent at All News 99.1, a CBS radio station in Washington, D.C. Other examples of his storytelling can be found at www.chashenry.com. 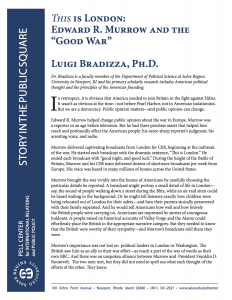 Bradizza is a faculty member of the Department of Political Science at Salve Regina. His primary scholarly research includes American political thought and the principles of the American founding. 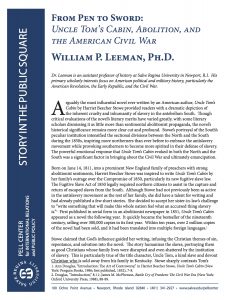 Leeman is an assistant professor of history at Salve Regina. His primary scholarly interests focus on American political and military history, particularly the American Revolution, the Early Republic and the Civil War. 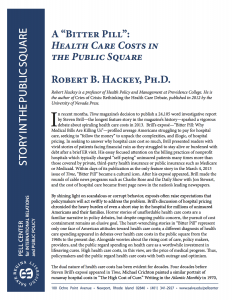 Hackey is a professor of health policy and management at Providence College. He is the author of “Cries of Crisis: Rethinking the Health Care Debate,” published in 2012 by the University of Nevada Press.